Akira Chinen and Shotaro Tamaki celebrated Kajimaya in Yafuso. 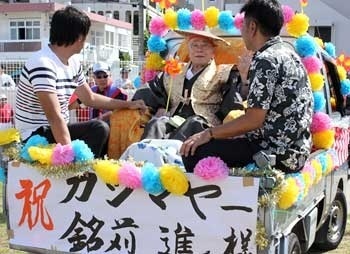 According to Community Leader Katsuo Yafuso of Yafuso, the community has never held a Kajimaya autocade. Chinen and Tamaki paraded down Yafuso Street in a convertible. 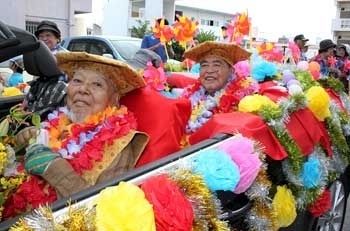 Approximately 200 people including the brass band club of Nakanishi Elementary School, Women’s Club, Children’s Club, and Ryukyu Corazon members joined in the parade. On October 18 at Iso Community Hall, Urasoe City, Susumu Mekaru celebrated Kajimaya. Chinen said, “I feel great,” and Tamaki said, “I feel happy.” Many people asked them for handshakes and photographs. Meanwhile, in the Iso Community celebrated Kajimaya for the first time in 20 years. Susumu Mekaru took part. An autocade started at his home and travelled to Iso Community Hall. Approximately 250 people gathered in the hall. Stick fighting and Eisa were performed, and Iju tempura was offered.